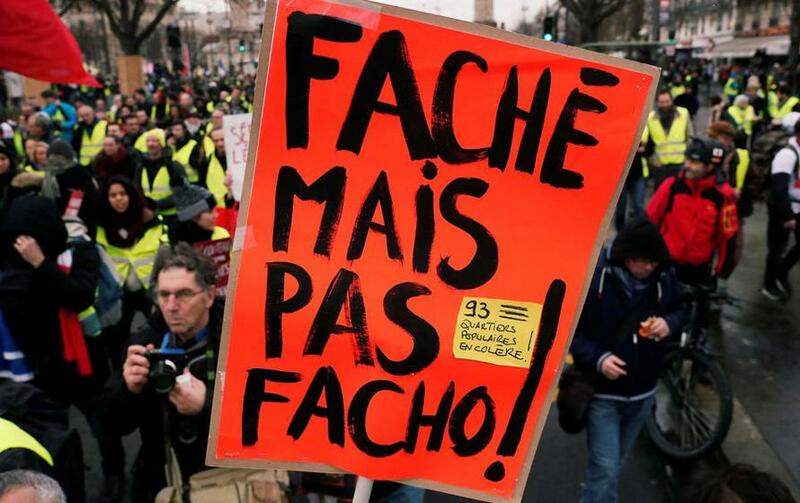 Yellow Vest protesters take part in a demonstration holding a banner that reads: “Angry but not fascist” in Paris, France on January 26, 2019. France’s battered social movements, fatigued after many retreats before Macron’s steamroller of reforms, started to show new signs of life. Polls in late January still showed that a majority of the population continue to support the movement, even after Macron canceled the planned tax increases and granted other concessions in December before launching a highly choreographed “national debate,” consisting of staged town-hall meetings and the pro forma taking of grievances in localities, as a means to regain legitimacy. Over the weekend of February 2-3, speculation even began to mount as to a possible national referendum to be held in May, the structure and outlines of which remain vague. If you have to pick your battles, then the most enduring revolt of Macron’s presidency and the first that successfully brought his forced-march of pro-business reforms to a halt was a fight not to be missed. A political space had opened up and many concerned citizens, including thousands of activists, workers, and teachers, mobilized to fill it. Just what were the real contours of this “peripheral France,” whose anger and resentment against elites has boiled over in weeks of protests and occupations? What would it take to bring under the same banner not only the struggling white working and middle classes, but also France’s perennially abandoned immigrant communities, who for decades have borne the brunt of austerity, exclusion, and police repression? Does a healthy democracy require more than top-down parties and bureaucratized unions? How can we confront climate change in a just way? Might a broad and horizontal movement, organized around participatory democracy on the local level, finally breathe energy into a public life that for too long has been abandoned to professionals? If the proposed law is a reminder of the commonalities between Macron and his “illiberal” counterparts in eastern and southern Europe, for a large portion of the French population, the idea of a repressive and hostile state is not new. For the problem of police violence to truly cease being a taboo, the debate cannot only be restricted to the occasional protest in city centers and the no-doubt disproportionate level of police impunity. Groups opposing police violence, such as the Comité Adama, named for a black man killed by police in 2016, have participated in Yellow Vest marches for just that reason: to bring the daily repression exerted on France’s immigrant communities out from the shadows where it has been relegated for years by the gatekeepers of respectable opinion. Adel, whose father moved to France from Algeria in 1969, grew up in the isolated suburbs north of Paris.